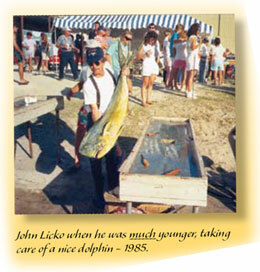 Looking back over the history of the Swansboro Rotary Club King Mackerel Blue Water Tournament, there are many memorable events. Remember when, in 1984, the total purse was less than $10,000 and there were less than 100 entries in the tournament? 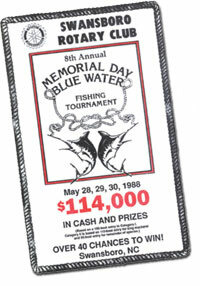 Remember when, in 1988, the tournament prizes topped the $100,000 mark? In that same year do you remember Lee Moore of WCTI-TV 12, one of the most experienced sportscasters in the broadcast business, as master of ceremonies? Remember in 1994, when the Rotarians changed the prize format to allow for an increased cash pay out structure by nearly $10,000? 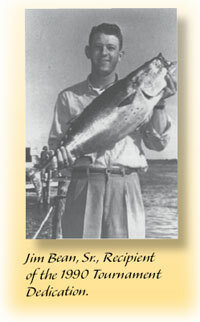 The list goes on and on, with all Rotarians, anglers, spectators and sponsors having special remembrances of their own. The town of Swansboro itself has a long history, including its importance as a port city. After the Civil War, commercial fishing became its sole industry. It is easy to understand why a town that has such deep historical roots with both its local waters and the species of fish within them, later becomes the host of a fishing tournament that reflects not only its surroundings, but also the depth and dedication of the community itself. It was in 1978 when the Swansboro Rotary Club came into form. It began with 23 members, with Ben Licko as appointed president. From there, the club grew by leaps and bounds, reaching out to the community of Swansboro. Not only did the number of members grow from year to year, but the amount of goals and projects to help better the community grew as well. The Rotary’s motto of “service above self” has always been reflected by the Rotarians through the activities in which they dedicated their time and effort. In 1980, one of those projects began. The first annual Swansboro Rotary fishing tournament came into existence. Memorial Day weekend had already been a time set aside to spend with family and friends. In time, it would be the weekend that combined holiday, sport fishing, family, friends, neighbors, community, and traveling visitors all into one grand event. Each year, the tournament stayed true to its original intent to provide an enjoyable weekend for its anglers, spectators, and sponsors. In 1991, the Blue Water King Mackerel Tournament became the first tournament on the newly established Southern Kingfish Association circuit. SKA President at that time, John Jones, acknowledged the Swansboro tournament as highly ranked, in comparison with other tournaments held along the southern Atlantic. As the club’s single largest fundraising activity, the proceeds from the Blue Water King Mackerel Tournament are dispersed throughout the community by way of scholarship funds, community funds, and fishing interest funds. The community pitches in to help the now more than seventy members of the Rotary with many of the projects, including the fishing tournament. They enlist the help of local residents, students, boy and girl scouts, and many others to help with the various needs of the tournament from cleaning fish to cleaning up. Remembering the beginnings and growth of this tournament would not be complete without remembering the tournament dedications of years past. The tournament has always acknowledged its founders, supporters and contributors, and loyal Rotarians. From memorial dedications of charter members such as Jim Bean, Claybron Gurley, Austin Guthrie as well as dedications to past president John H. Wood and loyal supporter Captain Charles E. “Chuck” Kay, each year’s tournament focused on appreciation of someone or something important to the tournament. John Licko and Jim Morse Davis, Jr. have been honored for their special contributions. 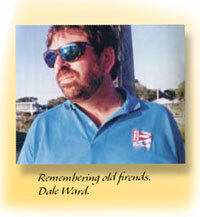 Dale Ward and Al Barnes are certainly missed, but never forgotten for all of their time and commitment to the tournament through the years. Dedications and much deserved credit have been given to the faithful sponsors, conservationists, sport fishermen, military service men and women, Captain’s Circle members, flood relief volunteers, and Hammock’s Beach State Park. We’re excited about this year’s 39th Annual Swansboro Rotary King Mackerel Five-O Tournament as we begin another year of giving fishermen, spectators, and sponsors what they want, while also taking the tournament to the next level. The focus remains on the memory of the founding members and their contributions along with the cooperation, participation, and support of the community and those within it who dedicate their time to this tournament’s success. Without all of you, it would not be the event that it is today. Information in this article gathered from the annual tournament publications, and the content within, from 1988 through 2006. In 1978, a dedicated group of businessmen in the Swansboro area, under the sponsorship by the Jacksonville Rotary Club, met to discuss the formation of a new Rotary Club. After several organizational meetings, the new club was formed with 23 members. Ben Licko was appointed president of the provisional club and after the new club was chartered, he stayed on as President for the following year. After 25 years, 7 of the charter members are still active members in the Swansboro Rotary Club. Over the ensuing years since 1978, many members have come and gone, but the net effect was a growth to the current level of over 70 members. Thanks to those that persevered in spite of many obstacles that face any new club, and to those who helped the club grow, the Swansboro Rotary Club is held in the highest esteem by over 40 clubs in the district. This honor only comes about from the dedication and time put forth by the members and from the generous support of the citizens in the surrounding communities.